From 1986 to 2017, every student attending the first-year biology course was invited to complete a one-item poll on a strictly anonymous basis. An average of 530 students a year participated in the survey. The results of the relevant year's survey – and of all previous years – were always openly presented to the class in the following lecture. The fact that commitment among Australian students to this view, the only one that involves refusal to accept evidence that humans have evolved from other animals, has always been low–and declining, suggested to Archer's team that no extra effort was needed to communicate to first year students the scientific evidence for human evolution. The top figure shows the percentage of students who, between 1986 and 2017, choose one of four options in relation to the human evolution: (1) humans were created by God within the last 10,000 years (green); (2) humans evolved over millions of years with the whole process guided by God (blue); (3) humans evolved over millions of years but God had no part in this process (red); or (4) they are uncertain what they think (yellow). Figures include lines of best fit from linear and quadratic regressions with 95% confidence intervals. 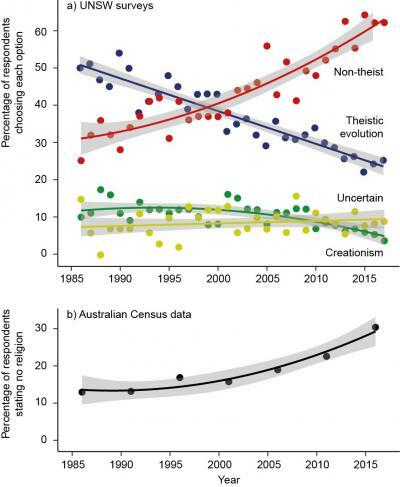 The bottom figure shows the percentage of the wider Australian public who have declared in national censuses between the years 1986 and 2016 that they have no religion.